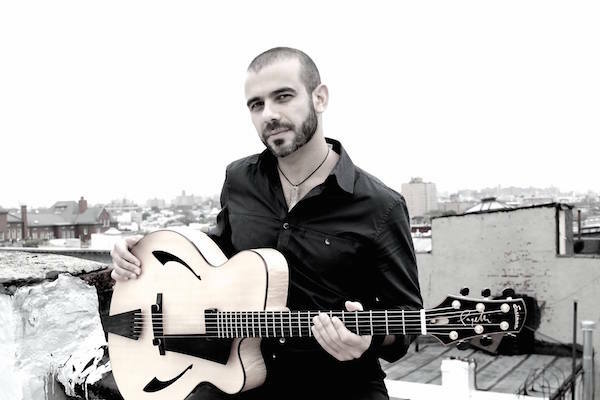 Brooklyn guitarist Greg Diamond has been an emerging force in recent years and is now situated at the forefront of a new generation of contemporary latin jazz artists in New York City. Endowed with technical prowess and, above all, an impassioned distinguishable sound characterized by his mixed Latin American origins, Diamond puts forth an attractive and innovative concept of latin fusion in a modern jazz context. Greg Diamond and his band have been seen performing at venues such as: The Blue Note, Iridium Jazz Club, Joe’s Pub, Smalls Jazz Club, Nublu, and Zinc Bar; not to mention numerous festival presentations, among them: The Madrid International Jazz Festival, Barranquijazz Festival, Jimmy Glass Jazz Festival, Teatro Libre Jazz Festival, Jazz al Parque Festival, and the Nublu Jazz Festival. In 2007 he was a semi-finalist at The Gibson International Jazz Guitar Competition hosted by The Montreux Jazz Festival in Switzerland. Diamond has shared the stage with Seamus Blake, Henry Cole, Antonio Hart, Jon Benitez, Stacy Dillard, Emilio Solla, Michael Mossman, Don Friedman, Gretchen Parlato, Asha Puthli, and many others. No Replies to "GREG DIAMOND QUINTET"